Broadband bonding works by adding in further lines and being connected to various ISPs, by combining multiple Broadband connections you receive a faster and more reliable service. Sharedband firmware comes pre-installed on your Sharedband supplied routers. Once installed and configured, the Sharedband Service is activated and the routers collaborate over your Local Area Network (LAN) to manage the flow of data across your multiple Broadband connections. Sharedband uses a variety of routers from consumer to commercial grade; typically one per line. The software will cope equally well with both slow and fast lines – the only thing that needs to change is the routers utilised. Our current range of routers will support bonded speeds in excess of 120Mbps. 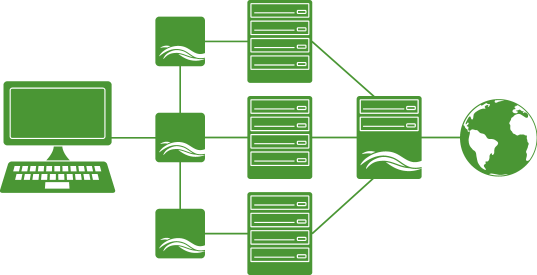 Software hosted on the Sharedband servers combine the streams of data traversing the multiple Broadband connections and connect directly to the Internet adding minimal latency. The packets are sent out and returned using a single Static IP so should all but one of the Sharedband aggregated lines go down, the Internet connection remains up. The only disruption customer will experience will be a reduction in speed until the other connections resume. Sharedband routinely tests the lines and dynamically optimizes the performance of the Sharedband virtual pipe, thus making sure that the service delivers the maximum performance over the aggregated lines. The software supports virtually all applications and networking protocols. With some Internet Service Providers (ISPs), Sharedband will actually increase application performance as well as support additional networking protocols. Sharedband is easy to use and is based on packet data transfers to ensure compatibility. Because the aggregation occurs at the IP layer, different ISPs and/or connectivity types can be used for each line (i.e. DSL, Fibre, Cable or leased lines – this significantly improves resilience when compared to a single provider solution. Connect your computers, VoIP devices or other IP based hardware to any of the routers in your LAN. Cable, DSL, fibre, leased line or any other broadband connection exchange. Aggregation servers in your region, combined with Sharedband Network Operations Center Software work with the firmware on your routers to bond connections and enhance connectivity. We have datacentres worldwide to provide fast service. For further information please view the following downloads.